Let us be your CTO. From custom solutions, pricing, and billing, we can say if something is a good deal or if you are getting ripped off. We can tell you what you need and compare it to what you want. We archetype systems for the future with prices for today. You are the CEO of your company. You know that you need to deliver your new product to your consumer. You have $1,000,000 in sales and you are growing at a regular rate. You are happy, but you want to get your product out to new markets without taking on huge overhead. What do you need to do? We not only can answer that question, but we might just be able to reduce your overhead. Usually, organizations do not automate when they could. If you are selling $1,000,000 and you want to expand your market share, you need to market to your consumer in a multitude of different ways. For example, if your target market is 15-20 year old males, you want to use YouTube. With that consumer base, you don’t want to market on YouTube ads (because most of your market will skip those ads), but you want to try and sponsor some popular YouTube content creator. Additionally, you may need to invest in scalable infrastructure. Many companies will have a sales staff, QuickBooks, inventory, and a shipping facility. If you switch to webware for your invoicing and bookkeeping, you would be able automate billing. By adding social media marketing and video marketing, you would be able to target your new audience. Once the scalable infrastructure is in place, you may not need as many people in sales as a website may be making more sales than the salesman. You could automate shipping information by having ordering of your product taking place on Amazon. A program might check the inventory of your product on Amazon and send an order off to the print-on-demand printer or your publisher to create/ship more product to Amazon. These infrastructure developments could save thousands and might pay for themselves in 2 months. Every business has problems that technology can solve and it’s important that the technology is designed, implemented, and tested properly. Let us handle that while you handle your business. 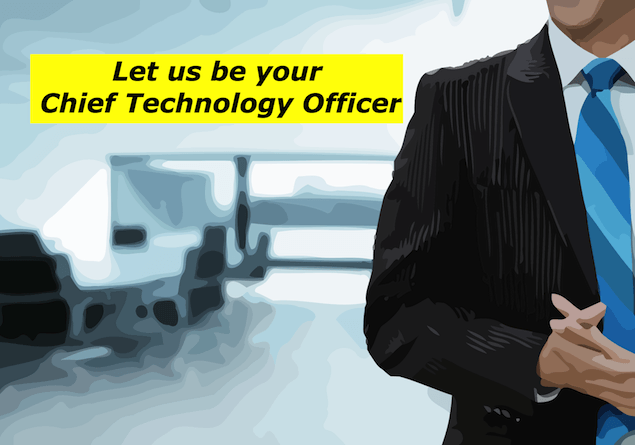 Let us be your Chief Technology Officer.